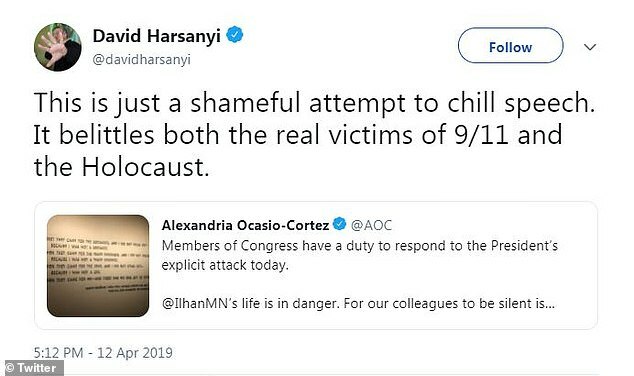 US Representative Alexandria Ocasio-Cortez has sparked outrage online after she used a poem written about the victims of the Holocaust to defend fellow colleague Ilhan Omar, in response to a 'dangerous' tweet from the president. An outraged Donald Trump tweeted ‘WE WILL NEVER FORGET’ on Friday night, accompanied by a 43 second video that showed Omar’s comment during a speech to the Council of American-Islamic Relations (CAIR), interspersed with footage from September 11. 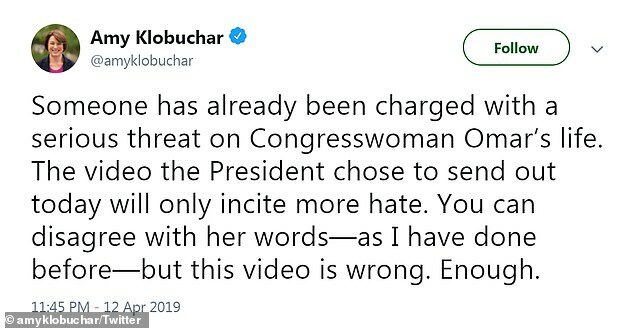 The video didn’t show Omar’s speech in full and Ocasio-Cortez was quick to clap-back at the president’s outburst, believing the tweet to be a ‘dangerous’ declaration of prejudice that could possibly incite harm against politician already facing a slew of death threats and abuse. 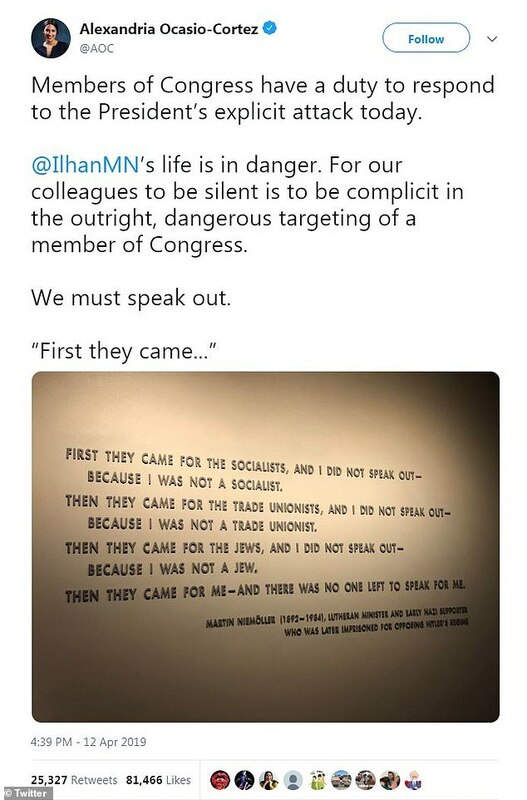 Alongside the rally cry, AOC also shared a picture of Martin Niemöller’s famous poem ‘First they came…’ that was inspired by the Holocaust and hangs on the wall of the US Holocaust Memorial Museum in Washington DC. Despite the poem sharing similar themes to her tweet, AOC has been widely blasted by critics who believe the use of Niemöller’s famed piece is ‘disturbing’ in defense of Omar. The outrage stems from a number of comments the Somali-American Democrat has made over the past few months regarding Israel. The criticism was first ignited after she suggested US support of the middle-eastern country is ‘All about the Benjamins’ – which many interpreted as a nod to the bigoted trope that rich Jews control the world. 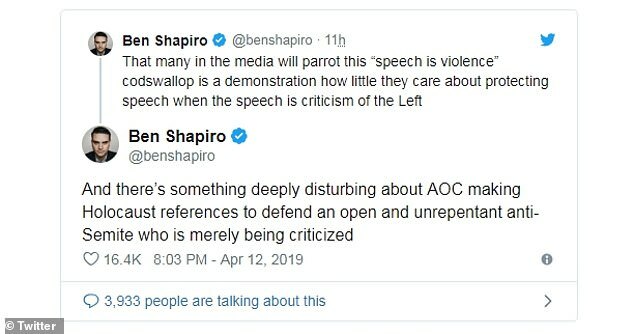 ‘There's something deeply disturbing about AOC making Holocaust references to defend an open and unrepentant anti-Semite who is merely being criticized,’ conservative commentator Ben Shapiro tweeted. Others took a different interpretation of AOC’s use of the poem, with one accusing her of attempting to ‘compare the President of the United States to Adolf Hitler’. In her full speech to CAIR last month, Omar said: 'Far too long we have lived with the discomfort of being a second-class citizen and frankly, I’m tired of it and every single Muslim in this country should be tired of it. ‘Was Bush downplaying the terrorist attack? 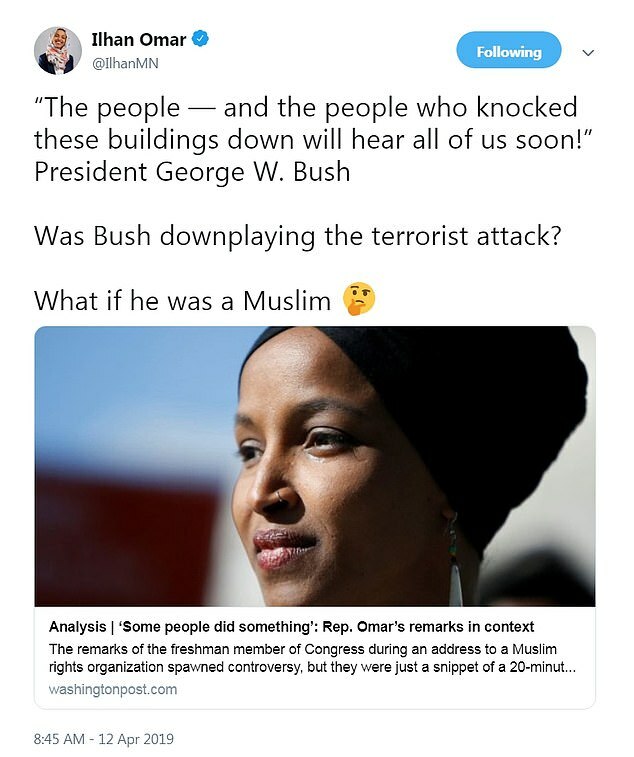 What if he was a Muslim,' she asked on Twitter. Progressive Democrats, including Sens. 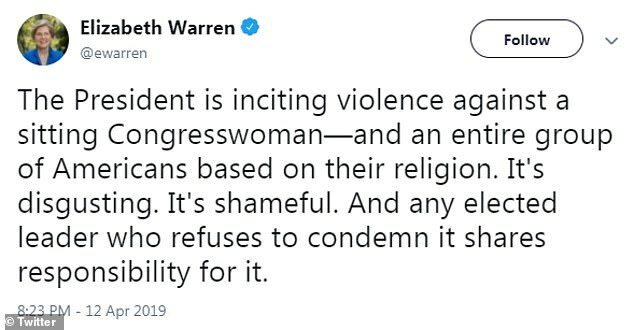 Bernie Sanders and Elizabeth Warren, lined up to support Omar in response to AOC’s plea for fellow lawmakers to condemn Trump's tweet targeting Omar.